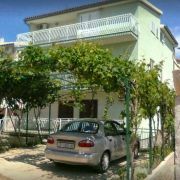 We offer two apartments 20m from the sea. The apartments are on the same floor and have a balcony. One apartment … More » is for 4 persons, the other is for 5 persons. Apartments have everything you need for a comfortable holiday. Free parking. Possibility to use the grill. Apartment 6+1, 3 bedrooms (2x double, 1x double + extra bed), kitchen, bathroom with WC, grill, 50m from pebbly … More » beach, 2 terraces (covered terrace + balcony), parking in the yard. The apartment has air conditioning, windows with mosquito nets. The owner has a berth for a smaller boat. Children pool. 120m from the sea. 3 luxury apartments. 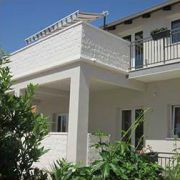 A(4+2), 2 bedrooms, 2 bathrooms, living room, modern kitchen … More » , terrace 35m2 with sea view. 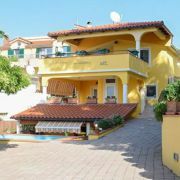 A(3+1) 3-bedded room, large covered terrace 26m2, sea view. 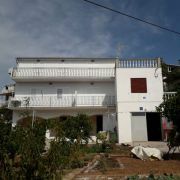 A(3+2) 3-bedded room, large courtyard 30m2, grill. WI-FI, TV/sat, air conditioning, parking. 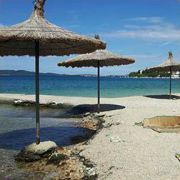 Our apartments Jole offers pleasant and quiet accommodation in a quiet location. The owner also lives in the house … More » . There is roofed table tennis, large shaded parking area, free WiFi, air conditioning, grill.